The wonderful quilters from the Bulloch Hall quilt guild have invited me to teach an Art Weave class for them next week. I did a trunk show for this guild in May and this time we'll be doing "hands on" rippin' and weavin' with fabric. 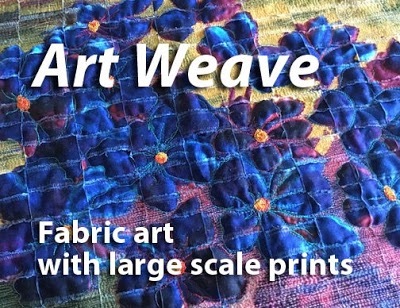 Art Weave class: making fabric art with large scale prints. This is a fun and creative class and I know I'll have a blast with these quilters. I also get to hang out with my friend, Holly Anderson, a certified quilt appraiser, pattern writer and instructor. We always have great conversations about quilting and the textile industry when we're together. 100 days and 100 quilt blocks—can you do it?